Anytime you go to sell your home in Fairfax, VA you will have to go through a home inspection which will include detecting for mold growth. If you have musty odors in your home, it is best to have a mold inspection done before the home inspector comes. Any signs of mold should be removed or cleaned completely before home inspections because it will be noted and a potential buyer may be turned off, and you might lose a sale for your home in Fairfax, VA.
Small amounts of mold or mildew can be wiped away with special cleaners. A musty smell might possibly mean it could be hiding behind your walls or under your flooring. Your best bet is having a mold inspection for your home in Fairfax, VA.
Noticeable signs of mold such as musty smell or mold symptoms. Identify the type of mold in your Fairfax, VA home. Find out where the mold is growing. To test indoor air quality by measuring the amount of spores in the air. To retest to be sure all mold has been fully removed. If you have mold in your home and have it professionally removed and fixed any issues related to mold growth, document all repairs. Keep a copy of the mold inspection for proof that a mold inspection was performed and your home in Fairfax, VA is free of mold. This will provide the homebuyers documentation if it becomes a problem later on. A mold inspection in Fairfax, VA will give you the assurance you need that once you find a prospective buyer and the home inspector comes to inspect your home, it will be free of any mold issues. Buyers with small children for sure do not want to take any chances on the health of their loved ones if there is even the slightest suspicion of any mold. Even if you are not selling your home and you suspect mold, call a profession mold inspection company so they can come and inspect your home and if mold is found, advise you of a plan to have it removed from your home in Fairfax, VA. Older homes in Upperville, VA that have the original flooring might be asbestos flooring tiles. These were relatively common in homes build before the 1980s. There might be no reason to panic or to ever have to remove these asbestos flooring tiles from your home in Upperville, VA. Meanwhile, it does help to know how to identify asbestos flooring because removing these tiles can be a risky business. It is best to hire an accredited professional asbestos removal company. They are properly equipped to handle the removal safely and properly, and they have the means to dispose of the asbestos safely and legally. Asbestos flooring was made into the 1980s but was most popular between the 1920s and 1960s. If you know when your house was built, or possibly renovated, this might help you in estimating when the tiles were installed at your home in Upperville, VA.
Measure the titles in question. 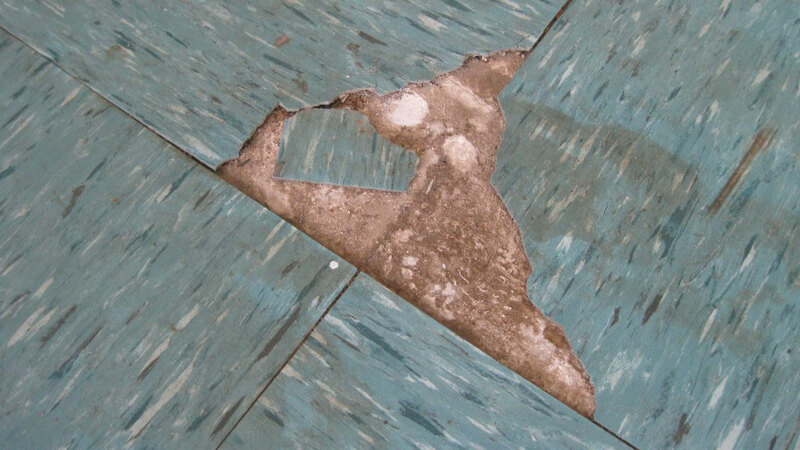 Asbestos flooring tiles were manufactured in three different sizes: 9”x9”, 12”x12”, and 18”x18″. Asbestos flooring tiles that are still intact are not a major risk and can be left in place and covered up with other products including carpet, vinyl, linoleum or concrete. Titles that are worn should be handled carefully. A main ingredient in asbestos flooring tiles is asphalt. The oil from the asphalt can leach out causing the tiles or the flooring beneath to show an oily discoloration. This is a sign that the tiles most likely contain asbestos. The only way to be completely sure if indeed your flooring contains asbestos material is to have a licensed asbestos inspector take samples of the tile in your home in Upperville, VA and have those samples sent to the proper labs for testing. Once you know for sure your home in Upperville, VA has asbestos flooring, you will know and can take the extra precautions if you ever choose to remodel your home. Remember, anytime you decide to remove the asbestos floor, it should be done by a professional asbestos removal company in Upperville, VA.